Home » Tech » Gaming » Pokémon Quest: best free game on the Nintendo Switch? For Pokémon fans it has been quite an eventful week as Nintendo announced 2 new titles (Pokémon: Let’s Go, Pikachu! and Let’s Go Eevee!) both will be released on November 16, 2018 on the Nintendo Switch. Now thats a lot to get excited about for die hard fans but Nintendo doesn’t want you to get inpatient that’s why they have just released Pokémon Quest, an RPG adventure mini game, it’s out right now on the Nintendo eShop and best of all it’s free! Pokémon Quest is a rather original concept for all regulars of the franchise. It’s a joyful mix between a classic Pokemon game, with hunting and dressage of pocket monsters, and a Minecraft-type sandbox game, including cubic graphics. All the characters, but also the elements of decorations are in 3D small cubes. You play as an explorer on Tumblecube Island where cubic Pokemon live. After choosing between Squirtle, Bulbasaur, Charmander, Pikachu or Eevee, you can start exploring the first zone. The goal of the quests is to go through different trainers to get to the boss. The system is very simple and intuitive, your team moves and attacks automatically. However, you can order them to use abilities, whether attacks or changes in statistics. It is also possible to dodge with the command of dispersion, very practical against the bosses. Eliminate opponents and finish a quest for ingredients as well as power gems called Gem-P. Falling Pokémon resurrects automatically after a delay, but without all their health points. If by bad luck, the entire team faints, the quest ends, but it is still possible to recover all items collected against coupons. Note that the experience gained is retained even in case of defeat. Players will be able to customize their Pokémon and develop a great friendship with them in the face of adversity. 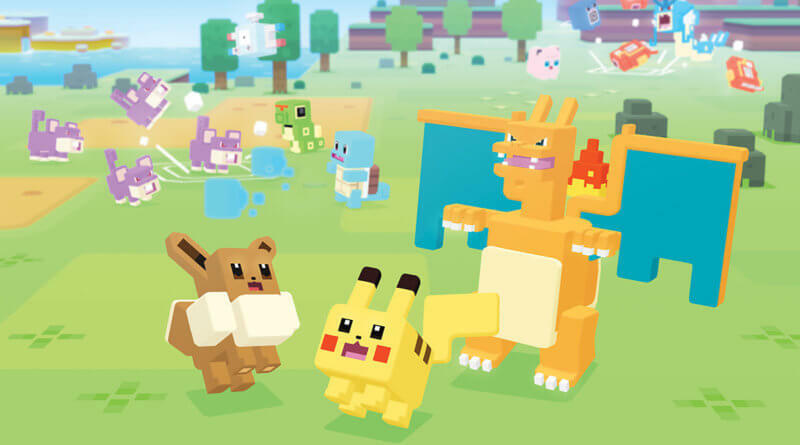 Thanks to the simplicity of its controls, Pokémon Quest is a title for Pokémon fans of all ages, says Shigeru Ohmori, director at Game Freak. The gameplay seems easy to access, a little tactical and bringing a rather original vision of the series. The game will also be available on mobile devices via the App Store and Google Play, end of June 2018.